ოსკარის 82-ე დაჯილდოების ცერემონია — საუკეთესო ფილმებისა და კინოხელოვანების რიგით 82-ე დაჯილდოება კინემატოგრაფიულ ხელოვნებათა და მეცნიერებათა აკადემიის პრემიით. ცერემონია გაიმართა 2010 წლის 7 მარტს და მასში მონაწილეობა მიიღეს 2009 წელს გამოსულმა საუკეთესო ფილმებმა. დაჯილდოება ჩვეულებისამებრ გაიმართა კოდაკის თეატრში, ჰოლივუდი, ლოს-ანჯელესი. ოსკარის დაჯილდოება როგორც წესი, თებერვალში იმართება, თუმცა იმ პერიოდში მიმდინარე ზამთრის ოლიმპიური თამაშების გამო 82-ე დაჯილდოებამ მარტის პირველ ნახევრისკენ გადაიწია. ოსკარის დაჯილდოებას აშშ-ში გადასცემდა ABC. შოუს მასპინძლები იყვნენ ალეკ ბოლდუინი და სტივ მარტინი. მარტინი ამ ამპლუაში რიგით მესამედ მოგვევლინა. ის მასპინძლობდა 73-ე და 75-ე დაჯილდოებებსაც. ბოლდუინმა კი პირველად უმასპინძლა ოსკარის დაჯილდოების ცერემონიას. აღსანიშნავია, რომ ეს იყო პირველი შემთხვევა 59-ე ცერემონიის შემდეგ, როდესაც დაჯილდოებას რამდენიმე მასპინძელი ჰყავდა. 2009 წლის 24 ივნისს სიდ გენისმა პრეს-კონფერენციაზე გამოაცხადა, რომ 82-ე ცერემონიაზე საუკეთესო ფილმის კატეგორიისთვის 5-ის ნაცვლად 10 ნომინანტი იბრძოლებდა. 20 თებერვალს, Beverly Wilshire Hotel-ში გაიმართა ცერემონია, სადაც გადაცემული იქნა აკადემიის ჯილდო ტექნიკური მიღწევებისთვის. შოუს უმასპინძლა ელიზაბეთ ბენკსმა. ყველაზე მეტი, ექვსი ჯილდო მიიღო „ქარიშხლის მბრძანებელმა“ საუკეთესო ფილმისა და საუკეთესო რეჟისორის ჩათვლით. ეს უკანასკნელი გადაეცა კეტრინ ბიგელოუს, რითიც ის გახდა მდედრობითი სქესის წარმომადგენელი პირველი ოსკაროსანი რეჟისორი. ყველაზე მეტ ნომინაციაშიც, 9 ნომინაციით ასევე თავი ისახელა ქარიშხლის მბრძანებელმა, „ავატართან“ ერთად. ყველაზე მეტი, 9 ნომინაცია დაიმსახურეს ფილმებმა „ავატარი“ და „ქარიშხლის მბრძანებელი“. გამარჯვებულებს აკადემიის ჯილდო გადაეცათ 7 მარტს გამართულ დაჯილდოების ცერემონიაზე. ფილმები, რომლებიც წარდგენილები იყვნენ რამდენიმე ოსკარზე. ფილმები, რომელთაც მიიღეს რამდენიმე ოსკარი. ↑ Finn, Natalie. “Alec Baldwin & Steve Martin Tapped for Oscar Duty“, E!, E! Online, November 3, 2009. წაკითხვის თარიღი: November 4, 2009. ↑ ABC announces Oscar pre-show hosts. USA Today. Gannett Company (March 1, 2010). წაკითხვის თარიღი: April 9, 2010. ↑ Bill Mechanic and Adam Shankman Named Oscar Telecast Producers. AMPAS. 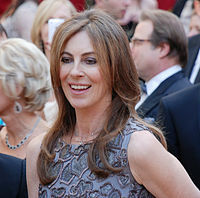 (AMPAS) (October 20, 2009). წაკითხვის თარიღი: October 20, 2009. ↑ Rebecca Paiement. “Hamish Hamilton to direct 82nd Academy Awards“, AOL, AOL Television, November 19, 2009. წაკითხვის თარიღი: November 23, 2009. ↑ Lowry, Brian. (March 9, 2010) The 82nd Annual Academy Awards. Reed Business Information. Variety. წაკითხვის თარიღი: March 9, 2010. ↑ Kissell, Rick. (March 9, 2010) FOX tops ABC's big week. Reed Business Information. Variety. წაკითხვის თარიღი: March 9, 2010. ↑ Hedley, Caroline. (March 26, 2009) Oscars ceremony moved to prevent clash with Winter Olympics. The Daily Telegraph. Telegraph Media Group. წაკითხვის თარიღი: March 13, 2010. ↑ Marc Graser. (November 3, 2009) Steve Martin and Alec Baldwin to Co-host the Oscars. RBI. Variety. დაარქივებულია ორიგინალიდან - September 17, 2012. წაკითხვის თარიღი: March 4, 2010. ↑ 82nd Academy Awards® to Feature 10 Best Picture Nominees. AMPAS. AMPAS (June 24, 2009). წაკითხვის თარიღი: April 9, 2010. ↑ Tom O'Neil. “Elizabeth Banks to emcee sci-tech Oscars“, Los Angeles Times, Tribune Company, February 12, 2010. წაკითხვის თარიღი: March 4, 2010. ↑ 'Hurt Locker' wins best picture. Los Angeles Times. Tribune Company (March 8, 2010). წაკითხვის თარიღი: May 6, 2010. ↑ Honorary Academy Awards - Oscar Statuette & Other Awards. AMPAS. AMPAS. წაკითხვის თარიღი: April 6, 2010. ↑ Irving G. Thalberg Memorial Award - Oscar Statuette & Other Awards. AMPAS. AMPAS. წაკითხვის თარიღი: April 6, 2010. ↑ Nominees & Winners for the 82nd Academy Awards. AMPAS. AMPAS. წაკითხვის თარიღი: March 11, 2010. ↑ “List of Academy Award nominations“, CNN, CNN.com, February 2, 2010. წაკითხვის თარიღი: February 3, 2010. ↑ Ditzian, Eric. “Oscar Night Belongs To 'The Hurt Locker'“, MTV (Viacom Media Networks), March 8, 2010. წაკითხვის თარიღი: March 8, 2010. დაარქივებულია ორიგინალიდან - March 11, 2010. ↑ International Broadcast. ABC. The Walt Disney Company. წაკითხვის თარიღი: February 27, 2010.
ეს გვერდი ბოლოს დარედაქტირდა: 13:36, 30 აგვისტო 2018.